ETH Zurich and the University of Zurich have developed water that doesn’t freeze at cold temperatures. Using various molecules with water, researchers have been able to cool the substance down to minus 263 degrees Celsius. Even then, there were no ice crystals formed in the substance. This technology could be used to develop new biomolecules and membranes for use in cryogenic electron microscopy (cryo-EM). Cyro-EM is often used in structural biology. In one application, a cryo-EM is used to freeze biomolecules mid-movement. Then, the structure is imaged at atomic resolutions. The system allows researchers to produce films that reveal how molecules interact with each other. Typically, the freezing point of water is 0 °C or 32 °F. In some conditions, water could remain a liquid at minus 40-42 °F. In water, the molecules are unorganized, according to researchers from ETH and the University of Zurich. In ice crystals, though, the molecules are arranged in three-dimensional lattice structures. ETH and the University of Zurich have devised a way to prevent water from forming ice crystals. It would remain a liquid even sub-zero temperatures. For this, researchers synthesized a new class of lipids or fat molecules. This, in turn, created a new matter called a lipidic mesophase. In operation, the lipids self-assemble and become membranes, which in turn form a network of connected channels that measure less than 1nm in diameter. With the technology, there is no room in the channels for water to form ice crystals. The lipids also don’t freeze. “Our main focus was to give researchers a new tool to facilitate the study of molecular structures at low temperature without ice-interfering crystals, and ultimately to understand how two main components of life, i.e. water and lipids, interact under extreme conditions of temperature and geometrical confinement,” said Raffaele Mezzenga, a professor at ETH Zurich. Using machine learning techniques, the U.S. Department of Energy’s (DOE) Argonne National Laboratory has developed a mathematical model that allows the industry to gain insights how water behaves. The model represents the thermodynamic properties of water as well as how it transforms into ice at the molecular scale. 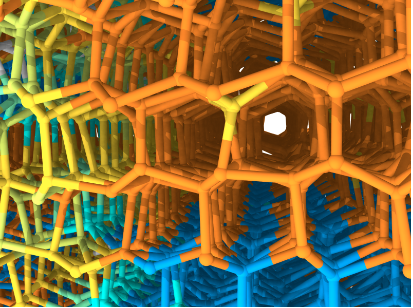 Modeling the behavior of water on the molecular scale has proven to be difficult. More than 50 different water models exist, but no single model has accurately represented water and its characteristics. To create water models, researchers used machine learning to devise a molecular model of water. They trained the model using information from a billion atomic-scale configurations with temperature-dependent properties. Researchers also used the Mira supercomputer at Argonne. The system performed simulations of up to 8 million water molecules. This was to study the growth and formation of polycrystalline ice. Mira, a 10-petaflops IBM Blue Gene/Q supercomputer, is capable of 10 quadrillion calculations per second. It consists of 48 racks, 786,432 processors, and 768 terabytes of memory. “We are trying to understand how to navigate the complex parameter space for any given model in order to capture a wide spectrum of water’s properties, which is extremely difficult,” Argonne nanoscientist Subramanian Sankaranarayanan said. “There is no existing model that can account for water’s melting point, its density maximum and the density of ice, all at the same time. “We were able to significantly improve the performance of existing high-quality water models using our hierarchical approach. In principle, we should be able to revisit all molecular models and help each one of them attain their best performance,” Sankaranarayanan said.